Based on the GENNOVATE findings, these tools and resources are designed to aid agricultural researchers in integrating gender sensitivities into their agricultural research for development (AR4D) projects. Through evidence-based inputs and recommendations, their purpose is to inspire and help scientists, practitioners, and policy makers to think gender into their research on, for example, climate-smart-agriculture, conservation agriculture, mechanization, farmer training events, and more. 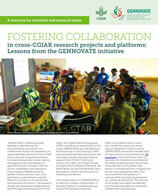 Select tools also offer practical advice for applying GENNOVATE methodological instruments to different AR4D contexts. While some of the resources have broad geographical relevance, others have a regional or country-level focus. This resource is for research and development practitioners working in agriculture and rural development in Rwanda. The objective is to provide information about the ways in which gender norms in Eastern Rwanda are changing, and which ones remain persistent. It finds that despite broader institutional changes, men’s and women’s roles and relations in relation to farming, and the gender norms governing them, are changing in piecemeal ways. 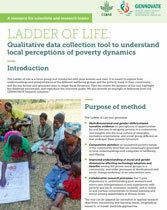 This resource examines GENNOVATE’s Ladder of Life exercise, a focus group tool conducted with poor women and men that explores their understandings and interpretations of the different wellbeing groups and poverty trends in their community, as well as the key factors and processes seen to shape these dynamics. The resource reviews the purpose of the tool, highlights key fieldwork procedures, and reproduces the interview guide. 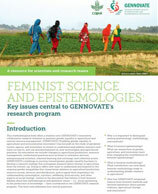 This methodological brief offers a window into GENNOVATE’s innovative collaborative research initiative to promote gender equality in agricultural and natural resource management. It addresses questions such as 1) Why is it important to distinguish among epistemology, methodology, and methods? ; 2) What is feminist epistemology? ; 3) What can researchers of gender, agriculture, and innovation learn from engaging the contributions of feminist epistemology? ; and 4) How has GENNOVATE integrated lessons from feminist methods and feminist epistemics about gender relations, agricultural change, and innovation? team of researchers across the CRPs and enabled them to carry out a study that covers the many regions where the CGIAR is active. In this note, the GENNOVATE research community shares lessons learned and success factors for other types of collaboration. It offers reflections on the value—and value added—of the collaboration; challenges of collaboration; and good practices for other collaborative research efforts. This GENNOVATE guide highlights and discusses social and gender norms surrounding banana production in the East-African highlands pf Uganda, Democratic Republic of Congo, Rwanda, and Burundi. Understanding these norms coupled with the ability to address them is essential for the development and design of high-quality banana-focused research for development projects that benefit men as well as women. This resource provides guidance for scientists, researchers, and rural advisory services in wheat-based systems on how to better target women in all communities and how to improve inclusion for everyone. It builds on 12 case studies conducted across India’s wheat belt under CRP WHEAT. It discusses how norms are shifting in parts of rural India to accommodate open recognition of women as farmers and managers of wheat and as adopters of associated technologies, including zero tillers, combine harvesters, and improved varieties of wheat. This resource examines how GENNOVATE’s “vignette” data collection method can be employed for mapping the engagement of household members along the nutrition pathway, beginning at the post-harvest or food purchase stage. The vignette tool can be expanded to analyze decisions and roles related to food production for household use and markets, including livestock raising and related products. As done within the GENNOVATE study, it can be combined with other methods or integrated in a larger data collection effort to understand the factors and processes shaping household production, exchange, and consumption. This guidance note for scientists and research teams acknowledges the complexity of marginalization processes and provides recommendations for making sure no one is left behind. It draws on GENNOVATE findings from a community in Bangladesh where the indigenous Santals, Bengali Muslims, and Hindus live and work together. poorer farmers and more often men than women. However, results also reveal that women have strong interest in mechanization as a way to improve their own circumstances. This resource discusses GENNOVATE’s Ladder of Power and Freedom, a qualitative tool whose purpose is to provide meaningful contextual and comparative evidence of local men’s and women’s own assessments and interpretations of the levels of agency in their lives, and the key factors and processes that they perceive to shape their capacities for making important decisions. in wheat and maize; 3) women don’t innovate; and 4) women lack resources for innovation. Data is drawn from six GENNOVATE Nepal case studies in the Myagdi, Chitwan, Rupandehi, and Jajarkot Districts. The resource posits that understanding and working with women in wheat- or maize-related innovation processes will help to improve the design and relevance of innovations. inequities that poor rural women face. The feminization of agriculture underscores the need to ensure that both men and women are able to learn about, try out, take up, and benefit from improved agricultural technologies, including climate-smart practices. This resource examines the impact of gender relations on Conservation Agriculture (CA) adoption and adoption mechanisms. 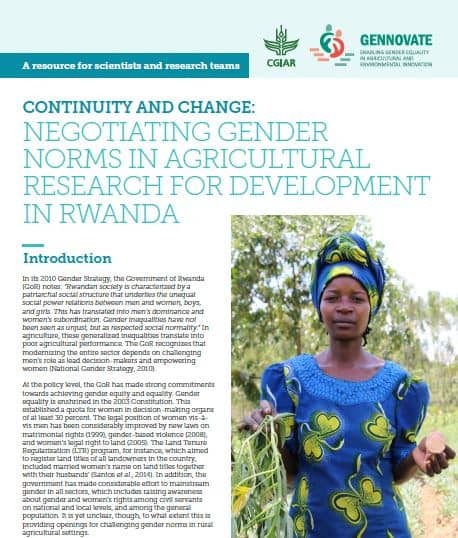 It offers a set of research questions to help integrate gender considerations into CA research for development, including on topics such as gender dynamics at the household and community level, minimum tillage, crop rotation and diversification, residue management, and knowledge networks. about technological options, learn effectively, and have the confidence to implement what they have learned. Over time, if their experience has been successful, they should be able to build on the training course to innovate by themselves in response to their needs and changes in the wider environment.